A traditional soap that is kindness itself. 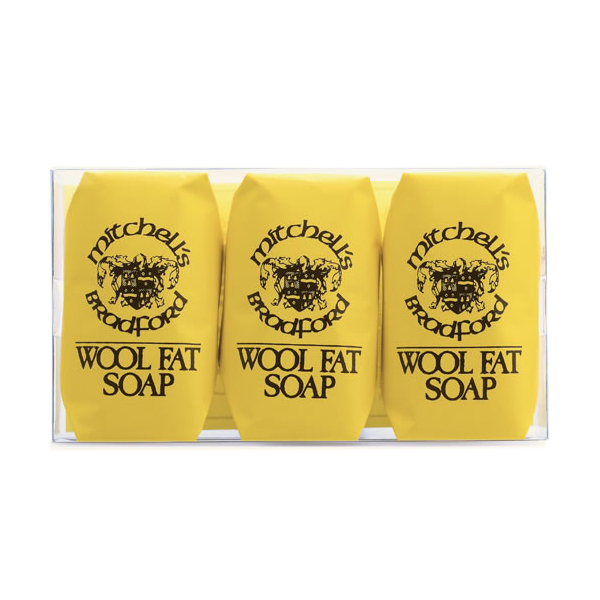 MITCHELL’S WOOL FAT SOAP was first produced in the early 1930’s by Bradford chemist Fred Mitchell who realised that the natural lanolin content of wool fat, which kept the hands of local sheep shearers and wool sorters so exceptionally soft, could also be beneficial to delicate complexions and sensitive skins. A simple and natural product, this soap is still made to Mr Mitchell’s original formula, based on a recipe from the turn of the century and incorporating lanolin from the wool fat as the key ingredient. Ingredients: Sodium Tallowate, Sodium palm kernelate, Aqua, Parfum, Coumarin, Linalool, Glycerin, Sodium Chloride, Lanolin, C177891, Tetrasodium EDTA, Tetrasodium Etidronate.